First step towards erasing the #Muslim stigma in the #Philippines: See them as equals! I'm a Filipino, baptized Catholic, turned atheist. I was really touched with the #illridewithyou gesture that came out after the hostage crisis in Sydney. A friend of mine who'd migrated to Sydney said that it was pretty much unbelievable when he saw it for himself. 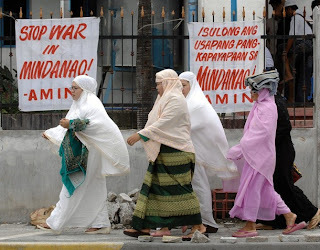 A good deal of the population of the Philippines (non-Muslims) do think that all Muslims = terrorists. Only those who'd actually known, and have Muslims around them, say as co-workers, friends and neighbors may have a better opinion of them. Our Muslim countrymen had long been denied services befitting a good government (heck, we're also in that bucket mostly) which makes it really easy for a bunch of disgruntled dudes with guns to scrounge up a flag, and start shooting at everything in sight, in the name of discontent and Allah. If we, as a people, are to do something, let's start by looking at our Muslim countrymen in the south as equals, treat them well and respect, then maybe the common Muslim man and woman, will step in to do something about these secessionists, enabling the country to march on as one, and finally eradicate this problem. I am a Christian and I for one am hoping that the day will come that the generalization of the word muslim & terrorist or hear the word Islam, Muslim, Alahuakbar. Then you start to paint a picture in your head of people with guns an ideology a flag shooting and bombing. We have different beliefs and ideologies. Yearning for a day when the stigma of muslims will be erased where we co-exist as brothers and sisters and as countrymen. We may have different beliefs, as humans we should to love and co-exist with our fellow humans. I believe that it is discontent in how they are treated and the stigma and the generalization and the sometimes unequal treatment that is fueling the hatred. I am from Mindanao I have many Muslim friends. The recent events that have occured has pushed mo to ask the query of what they think & their opinions about it. So it goes the postive and the negative have been stated.